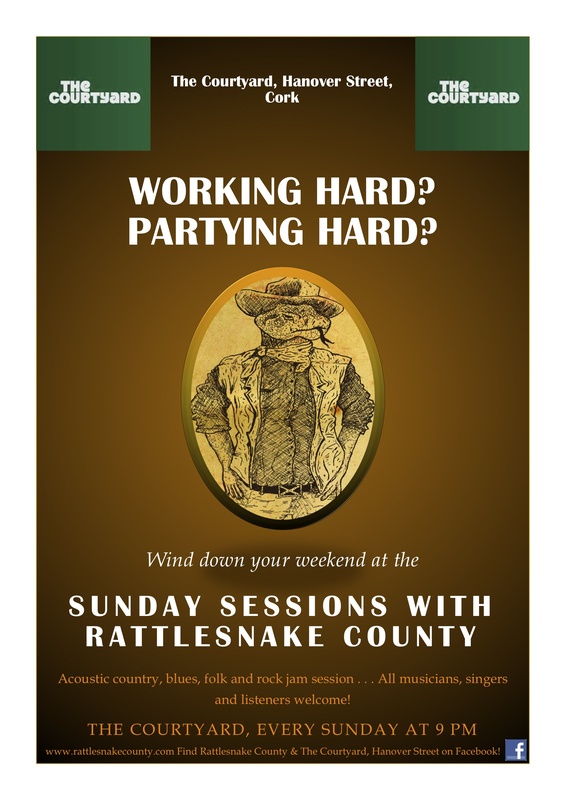 Rattlesnake County are delighted to announce that we are adding a weekly jam session in Cork to our schedule! Join us in The Courtyard on Hanover Street every Sunday at 9 pm for our trademark mix of acoustic country, folk, classic rock and good times. As always with our sessions, musicians and singers of all skill levels and musical persuasions are very much welcome. Bring your didgeridoo or washboard, give us a your rendition of Highway to Hell or Spancil Hill – we’ll always do our best to join in! Sunday sessions in The Courtyard are the perfect way to wind down after a hectic weekend, whether you’ve been working, partying, or both. We want to give a shout-out in particular to the hard-working bar and hospitality staff of Cork – what better way to end your weekend than to relax in The Courtyard with some classic jams and the beverage of your choice? Join us tomorrow, Sunday 23rd February at 9 pm for the first ever Sunday Session in The Courtyard! Keep an eye on our Facebook page for updates about our sessions and gigs!